"This lower gravity American pale ale is brewed with rye malted locally in Hadley, Massachusetts (Valley Malt). Hazy orange in appearance with balanced hop aromatics from Citra and Columbus, Treecreeper drinks smooth with an ultra-light, pillowy mouthfeel. The rye malt component allows for a uniquely rustic and earthy take on our standard hop-forward offerings. Flavors combine a dry bitterness with refreshing tones of zippy citrus, orange pith, and lemon." Pours the typical hazy orange. I got two fingers of white head that stuck around for the duration of drinking. The best way to describe the aroma is mango juice poured over freshly-cut grass. Nice juicy orange from the citra pops off first, but that rye malt is makes for an equally big grassy flavor. The rye has almost a barnyard quality; not quite saison level, but still funky (in a good way). Not only orange in this, but lemon with decent acidity. Somehow the acid flavor works well off the rye as it adds to the earthy notes. It doesn't have the hop intensity as a lot of other Trillium offerings, but this works in a different way as it focuses more on a balance between hop bitterness, citrus juices, and grassy flavors. Mouthfeel is soft and hugs your tongue. I like how it is refreshing due to the relatively low abv, but it is not thinned out at all. The grassy and earthy flavors would try to make this dry, but the citra hops help make it refreshing. This is a incredibly easy to drink. 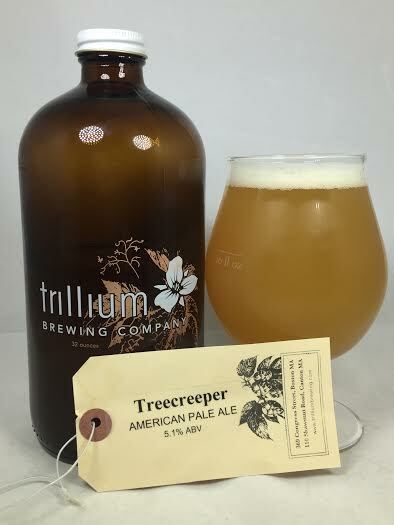 Treecreeper may not have been the hop nuke that other Trillium IPA's/pale ales have become known for, but that wasn't the goal. The combination of the rye malt teamed with the juicy hops and the bitterness of Columbus hops to make a well-balanced pale ale. To the best of my knowledge (which is obviously never flawed), this offering has never been bottled like so many Trillium beers. I don't know why it has been relegated to a "draft only" status, but if they put this into the familiar 750ml bottles, it would fly off the shelf (and I'd be one of the people making that happen).